The weather forecast indicated that we’d be facing 10-12 knot winds from the west, so we decided to start the iSUPcore! session in Choeng Mon today. The eastern side of the island being more protected from the breeze meant we had flat water to paddle on. And the weather was a little overcast, making it quite pleasant to paddle. 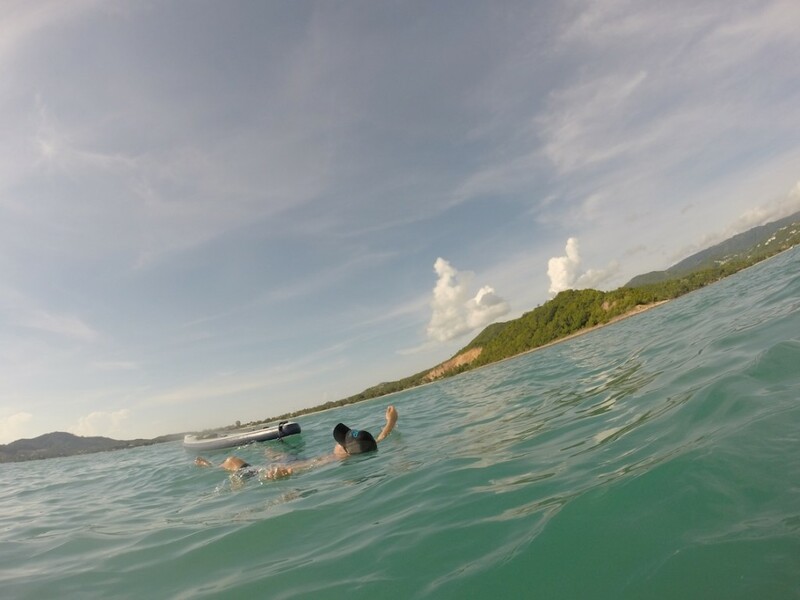 We headed out past Koh Fan, a small island just off Choeng Mon beach, and then paddled along the coast line for about 3km. It’s mostly a rocky shoreline and cliffs along the coast, until you turn the corner into Hanuman Bay where there’s a stretch of white sandy beach. Paddling at a cruisy pace, we stopped for a swim, and then headed back to Choeng Mon. This might become one of our paddling tours for experienced paddlers. If the conditions are right, and we pack some refreshments, we could paddle into one of the beaches at Hanuman Bay, or even further down to the north end of Chaweng. 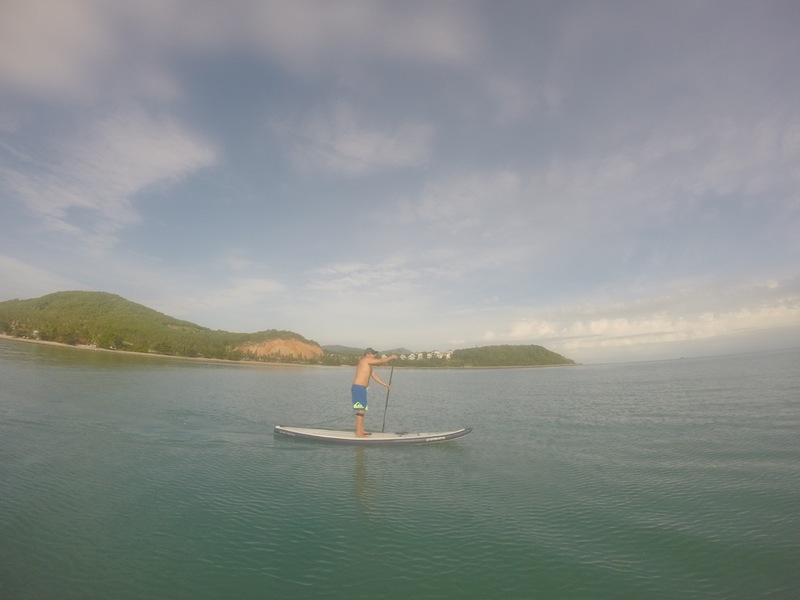 If you are interested in trying out Stand Up Paddling, we are usually at Choeng Mon beach on Tuesday mornings from 10am for our iSUPtastic! sessions.  We will be offering 15 minute “taster” sessions for a small fee to anyone who turns up, it’s a great way to discover just how easy and fun paddling can be. The weather was a bit overcast on Tuesday, which meant it was a bit cooler than it has been for the previous couple of days – perfect paddling weather! Consequently there were a few more people strolling up and down the beach – including Greg and his wife from Melbourne, Australia. 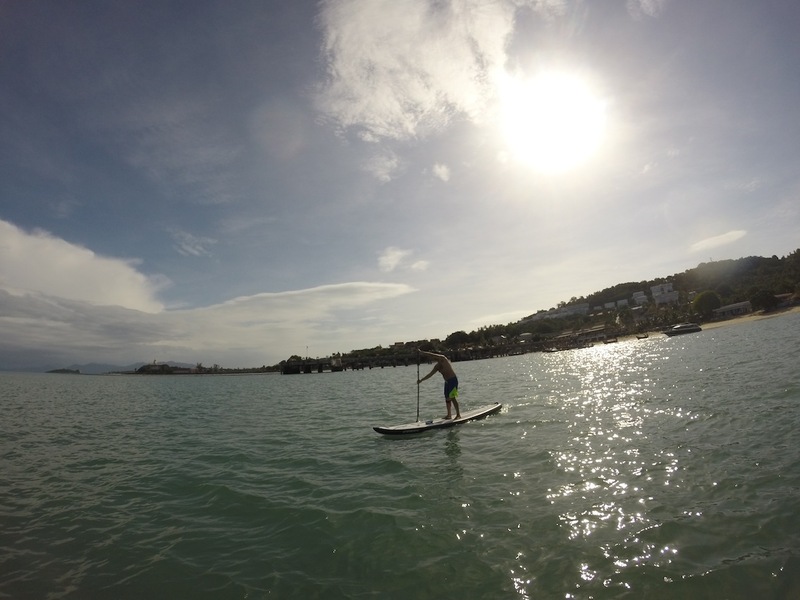 Greg had previously spotted us on the water during last Sunday’s SUP5.0 session, and was keen to give SUP a go. 10 minutes (and only a couple of “splash downs”) later, Greg was competently paddling and chatting with me on the water… it’s hard to express in words the pleasure we get seeing previously dubious first time paddlers gaining confidence and enjoying themselves on the water – great job Greg! 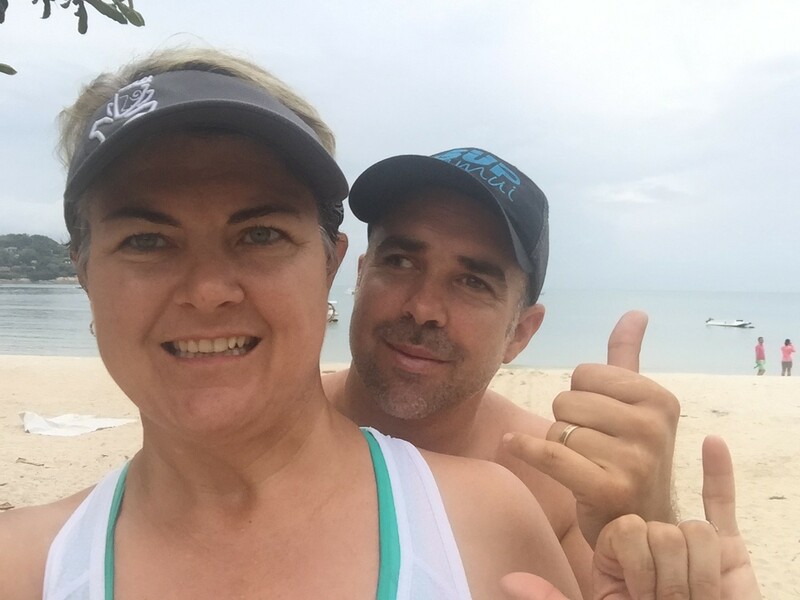 Whilst relaxing afterwards with Greg at our favourite beachside restaurant (Crystal) we were approached by Kurt, who along with his wife Kerry are experienced paddlers from California. They had never paddled on inflatable Stand Up Paddle boards before, and were pleasantly surprised with the stability and performance of our Starboard Astro’s during their quick trip around the bay. All in all, a successful start to the iSUPtastic sessions, looking forward to next week – see you on the water! 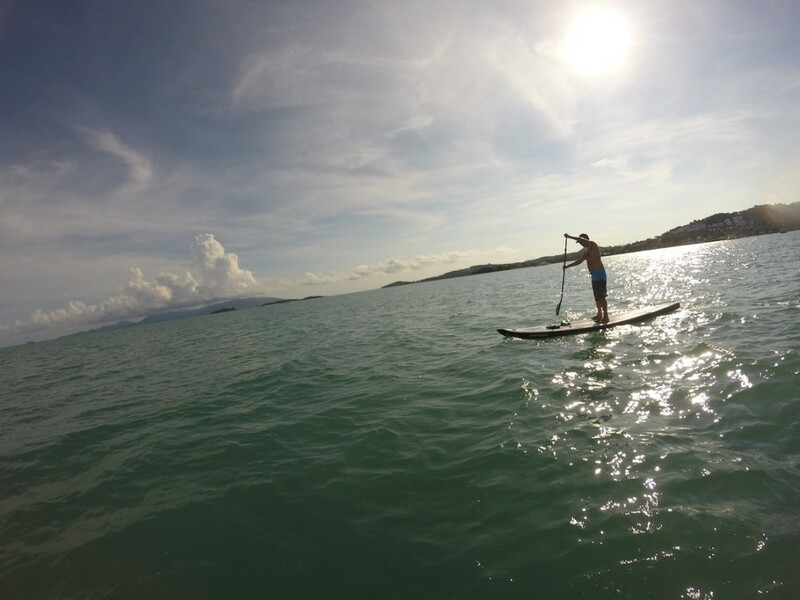 We’re excited to bring SUP 5.0 to Koh Samui, and today was our inaugural 5km time trial. 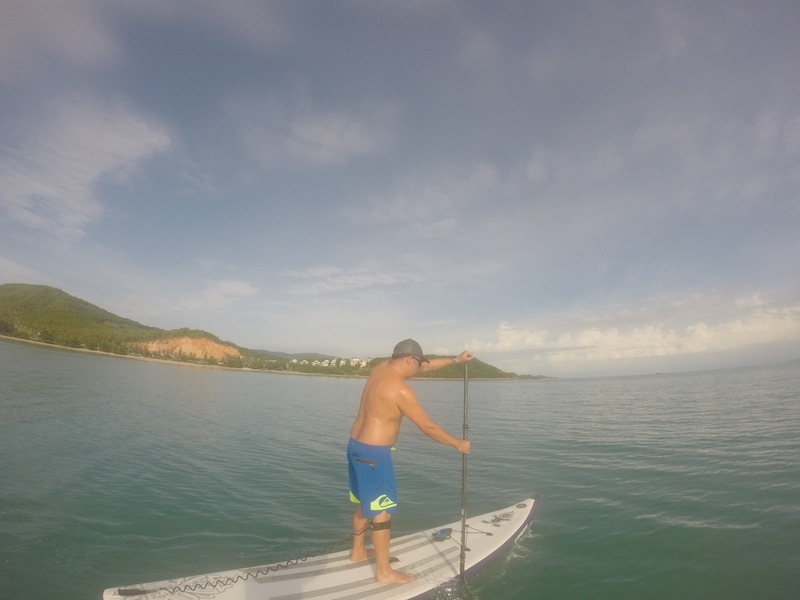 We started at Cheong Mon beach, just in front of Crystal Restaurant, and paddled north to Tongson Bay (in the north east of the island). We weren’t sure of the distance, but found that the beach in front of the Melati Resort was a perfect 2.5km turning point. The course started out fairly glassy and the wind was forecast to be 8 knots W. It became a little choppy as we turned the corner into Tongson Bay. The local fisherman was probably surprised to see us at that point. The return leg was more fun with the breeze behind our shoulder and we caught a few runners around the Tongson Bay southern headland. 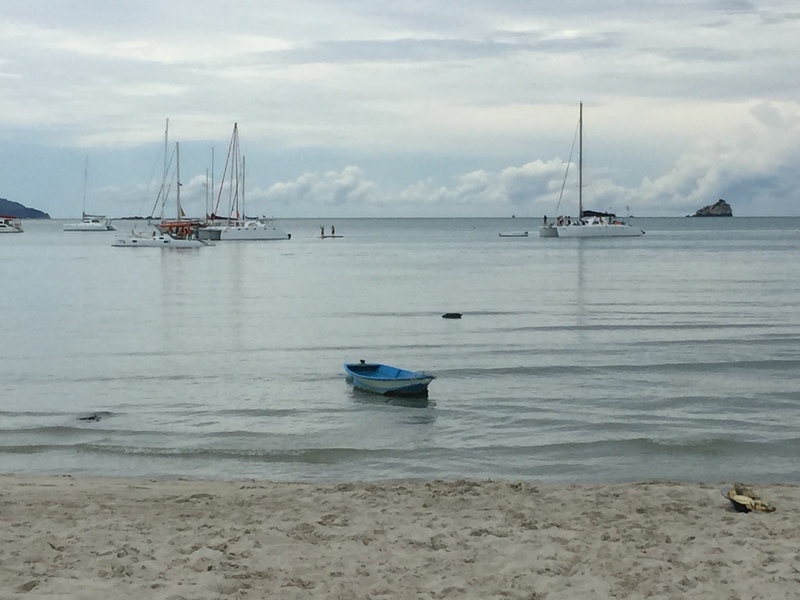 It was nice to get back onto the glassy conditions and cruise past the moored yachts back onto Cheong Mon beach. After a quick swim, we headed over to Crystal, our favourite beach front restaurant, for fresh coconuts and a cooked breakfast. Today’s results was 44:34 for Ian, and 51:42 for Tammy. This compares to our last SUP 5.0 in Australia, where our times were around 42 and 49 minutes. It’s completely different conditions up here, today it was 29C at 8am, and we hit some wind and also some chop at the Tongson Bay headland. We completed our first iSUPcore! 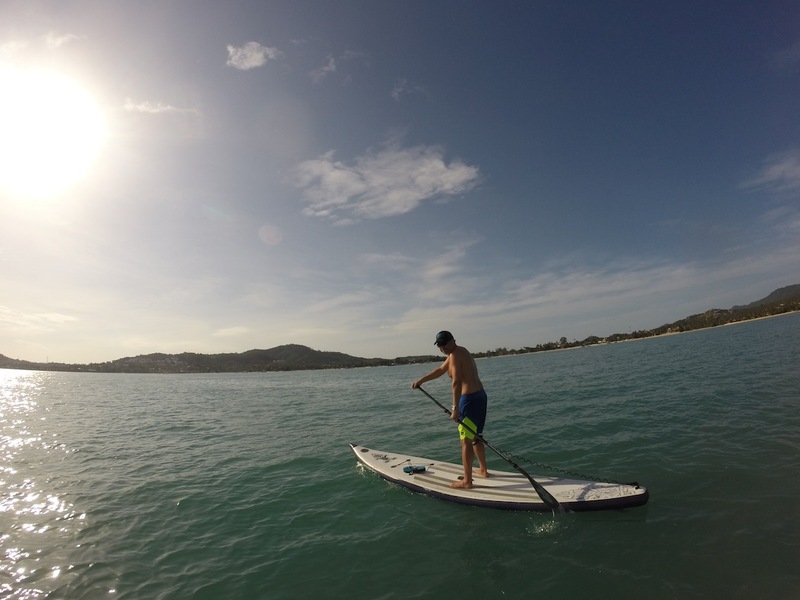 fitness session on our Standup Paddle Boards today! We set off from the the boat ramp near the Bangrak Seatran ferry pier and headed west into a 5 knot headwind, resulting in great workout conditions with the wind in our faces keeping us cool and invigorated as we powered through the smallish chop and occasional boat wash.
After about about 2.4 kms we reached the headland between Bangrak and Bophut beaches, on the north coast of Koh Samui. There was a yellow marker flag which provided a convenient turning point (We may also use this as part of our SUP 5.0 SUP race on Sunday morning). As this was our first session we decided that a quick dip was appropriate to cool off before pointing ourselves east and enjoying a light-downwinder back to the boat ramp. On our way back we were waved at by several of the passengers and crew of the speedboats that were making their way across to Koh Phangnan and day tours to the Angthong Marine Park. Navigating the wash from speed boats can be a bit daunting for beginners, in our case it definitely tested our core strength as we bounced through the waves (nobody fell in). Therefore we have decided that going forward we will run the iSUPcore sessions at 7:00am on Thursdays, to avoid the speedboat rush hour and it will also be a bit cooler. Inflatable SUP’s are super convenient if you don’t have anywhere to store a hard board, and they are fairly light which makes it easy to lift onto your car’s roof racks. The best part is that they pack into a backpack that’s small enough to be your check-in luggage on a plane, which means you can take your paddle board on every holiday! 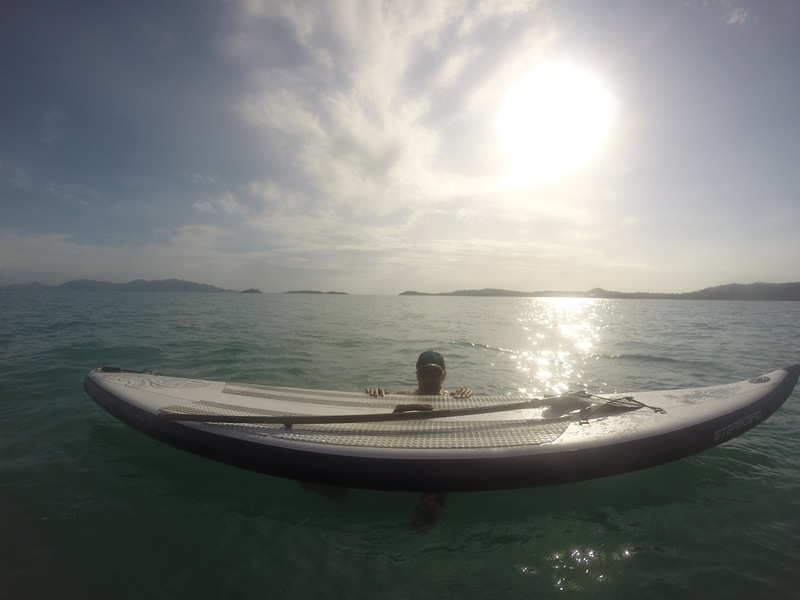 We have been paddling on inflatable Stand Up Paddle (SUP) boards for a couple of years, and we love them! When it came to buying our own boards, we decided to buy the Starboard 12’6 x 30″ Astro Touring boards. They are great for gliding along flatwater and provide enough balance when you’re the chop. In the right conditions, you can even catch a few small waves. We’ve travelled with our inflatable boards on long haul flights to Singapore, Thailand and Tonga; and domestic flights from Sydney to Hamilton Island, Byron Bay and the Gold Coast. 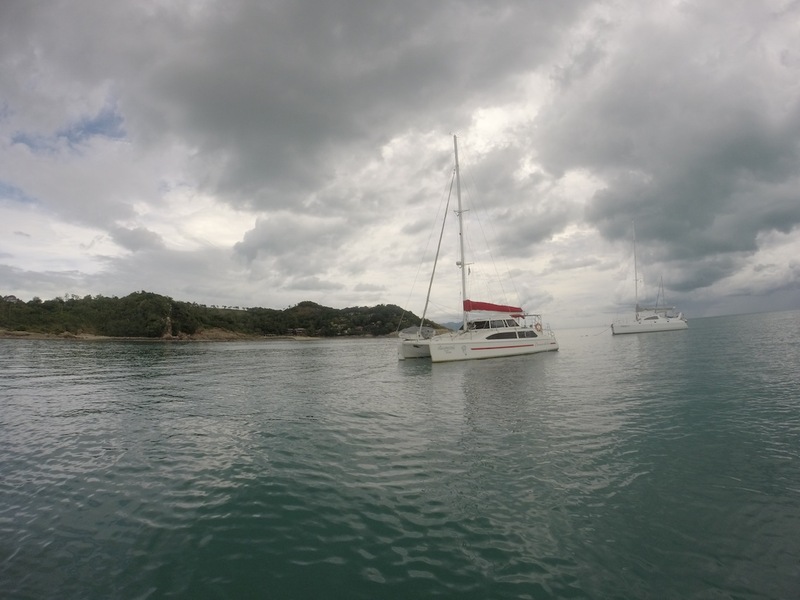 We even took them on a 5 day live-aboard sailing charter around the Angthong Marine Park, Koh Tao and Koh Phangnan in the Gulf of Thailand! FUN! 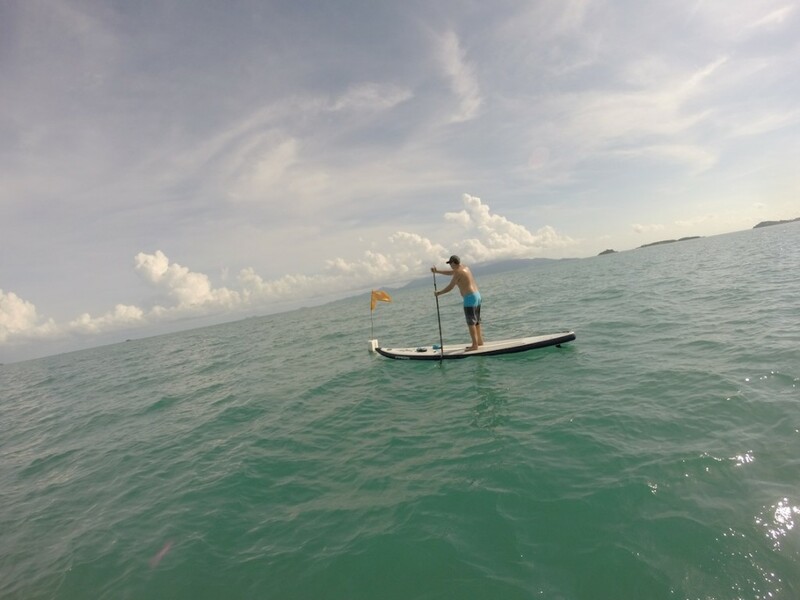 Bring your family and friends along to one of our iSUPtastic sessions, held at Cheong Mon beach every Tuesday at 10am, and we’ll show you our range of Starboard inflatable paddle boards. 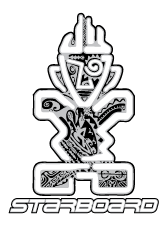 After seven great years in Sydney, during which we’ve made some fantastic friends and discovered our passion for Stand Up Paddling (SUP), it’s time to embark on a new adventure. 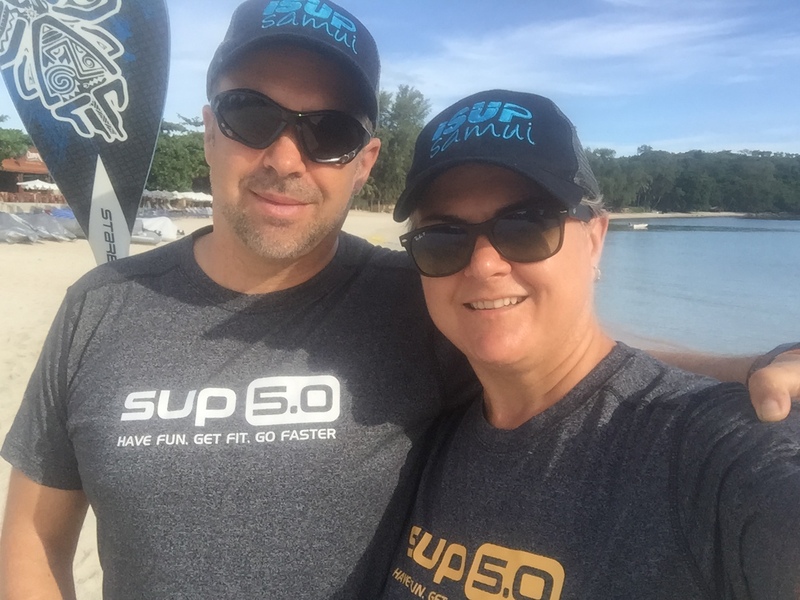 We are excited to be launching our SUP business in Koh Samui, Thailand and we will be hosting one last party before we leave Australia. Drop in after work for a drink and some tasty Italian finger food on Friday 29th May. We are selling a limited number of iSUP Samui branded caps and t-shirts on the night.